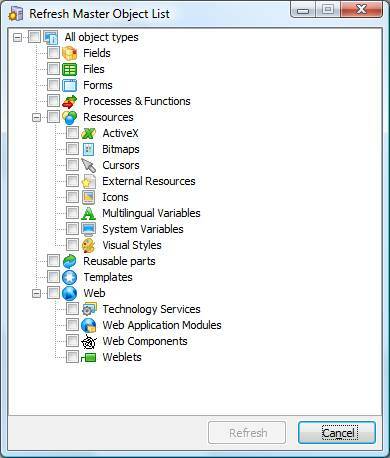 Refresh Master Object List returns a complete set of data from the Master system for the selected object types. Once the data has been downloaded, the information is merged with the existing Repository data and displayed in the Repository tab. It is recommended that a complete Refresh be performed initially. This initial refresh may return many thousands of objects that do not currently exist in the local Repository. 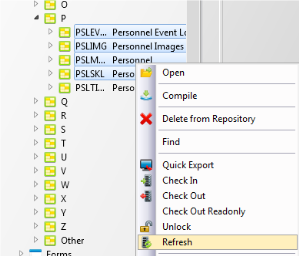 Alternately to Refresh the definitions of a group of objects already available in the local repository, select the group of objects and right click to select Refresh. Object data is downloaded from the Master in batches and then trickled into the local Repository to avoid impacting performance on the local machine. You can use F5 at any time to force the objects to be refreshed immediately. 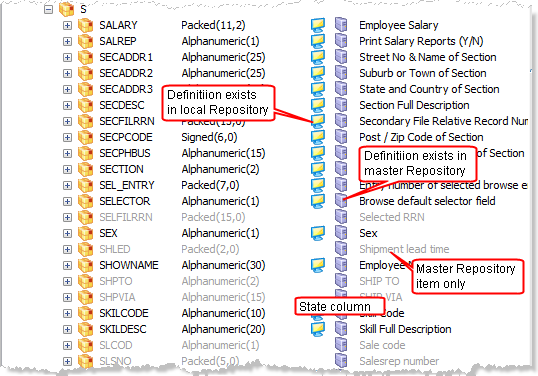 Columns in the Repository tab allow you to see whether an object is known locally, on the master or both. Further, objects known only to the Master appear as gray to highlight the fact that they are Master only and will therefore only have limited capabilities on a local system. Master state is persistent. Closing and restarting Visual LANSA will show the same Master and local data. As this is a snapshot, it is recommended that you regularly run a Refresh to ensure that you have an up to date view of the Master. Alternatively, repository synchronization can be used to ensure that changes made both on the Master and, through Host Monitor, are reflected in local repositories. Tip: Improve local repository update time by minimizing the number of open objects when performing a Refresh or alternately selective to refresh a set of objects.